The atmosphere of Titan can be seen on the Saturn moon's limb in this stunning view from NASA's Cassini spacecraft. Alien planets in orbit around red dwarfs, and even rogue planets with no stars to call home, might have surface oceans loaded with organic compounds, making them similar to Saturn's moon Titan, a new study suggests. 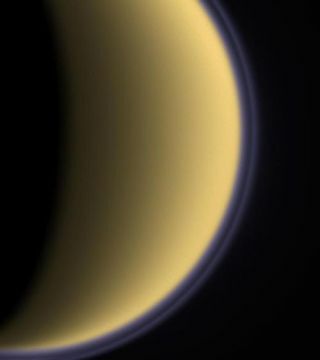 Titan is the only known moon that has a thick atmosphere, and the only world besides Earth to have liquid on its surface. The seas of Titan are made of liquid methane, often leading to speculation as to whether or not they could host life, much like how life on Earth depends on water. "Astrobiology has historically focused on liquid water as the habitable liquid, and certainly it works well on Earth, but there is growing interest in the possibility of liquid methane," said researcher Christopher McKay, a planetary scientist at NASA Ames Research Center. To see if worlds like Titan could host oceans when not orbiting Saturn, McKay and planetary scientist Ashley Gilliam calculated what a Titan-like world might be like while orbiting around a relatively dim M4 red dwarf star. "The reason we chose to look at red dwarf stars is because they are the most abundant stars in the galaxy," Gilliam said. "It is much more likely that we would find another Titan-like world orbiting an M-star than we would orbiting a star like our sun." The researchers also calculated what Titan might be like orbiting the slightly hotter M3 red dwarf star Gliese 581, where a number of planets have already been detected. "We chose to look at Gliese 581 because we believe that it could support a Titan-like world as a moon of one of the giant planets, and thus could already be supporting a world with comparable conditions to Titan," Gilliam said. If Titan was placed at a distance from these red dwarfs so that it received the same average amount of light as it received from the sun, the scientists estimated this extra infrared could warm its surface by about another 10 degrees Celsius. A partial view of Titan's Ontariou Lacus (right image) from 680 miles away, or 1,100 km away, shows what appears to be a beach in the lower right of the image, below the bright lake shoreline. An image was also taken of the lake feature in June 2005 (left image). Due to flares, red dwarf stars can generate more particle radiation and specific kinds of ultraviolet rays than our sun does. This could potentially generate more haze in Titan's atmosphere, which would then block sunlight and keep the planet cooler. Nevertheless, liquid seas would be possible, the investigators found — such oceans would exist if Titan was 8.4 to 23 percent of an astronomical unit (the distance Earth is from the sun) from an M4 red dwarf, and 63 percent to 166 percent of an astronomical unit from Gliese 581. If Titan was a rogue planet with no star to call home, the researchers wondered if it could still be covered in seas due to geothermal heat. The researchers calculate Titan would need to release about 20 times more geothermal heat than Earth does to keep its current surface temperature, which is unrealistic for a world its size. However, if its atmosphere was 20 times thicker than current levels, it could retain enough heat to still have surface oceans. "It is not clear how much atmosphere a rogue planet would have," McKay cautioned. In order for a starless planet to have liquid methane seas on its surface, a more realistic scenario might be for it to be both larger and warmer than Titan and have a thicker atmosphere, he suggested. Gilliam and McKay detailed their findings online April 2 in the journal Planetary and Space Science.